"If a test for a masterpiece tune is inexhaustibility of interpretation, then a test for tune mastery is the interpretation itself. Husband and wife, Michael Rooney on harp and June McCormack on flute bring a blended freshness, forcefulness, and finesse to their interpretation of Irish traditional music that stamp them as one of Ireland's premier duos. 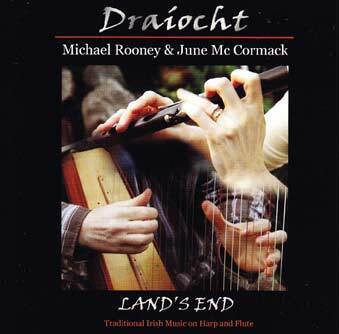 In 2004 their tandem debut recording, Draiocht, earned critical kudos on both sides of the Atlantic. My own enthusiasm and admiration for the CD placed it among the top albums of that year in the Irish Echo newspaper. [ Michael and June's playing is distinguished by an unhurried tempo, abundant imagination, tasteful arrangement, instinctive communication, and exceptional skill, capped by a complementary style of performance that is much more than the sum of individual parts. These two gifted players breathe life into music as it breathes life into them, and the spellbinding effect is a sustained, seamless pleasure that rewards repeated listening. Every time I play the aptly titled Draiocht an Irish word for magic and enchantment they formally adopted as their duo name, I discover more nuances and embedded details attesting to their mastery. This reputation for high-level playing is not new to either musician. From Scotstown, County Monaghan, Michael Rooney learned music initially from his father, Micheal, and received instruction from Janet Harbison, Pat McCabe, and Jimmy and Ciaran Burns. Michael earned junior and senior All-Ireland titles on harp and concertina, and won the Keadue and Granard harp competitions several times. His 1997 solo debut, Ocras, featured eight of his own compositions on the theme of the Great Famine, and some of his tunes also appeared on another fine album released three years later, Oisin Mac Diarmada/ Brian Fitzgerald/Micheal Ó Ruanaigh. From Ballintogher, County Sligo, June McCormack initially learned flute and tin whistle from her father, Seamus, and also took lessons from Alfie-Joe Dineen, Paddy Ryan, and Carmel Gunning. In 1998 June enjoyed what can only be regarded as a breakout year, winning the All-Ireland senior flute championship, : receiving TG4's Young Traditional Musician of the Year award, and, as a member of the Sligo-Leitrim ; band Siona, recording Launching the Boat, an album featuring her future husband as a guest. For the past few years Michael and June have led an adventurously peripatetic existence, taking their music to Australia, New Zealand, and the United States, where Michael wrote the title tune of their new duo recording in Montauk, the easternmost point on Long Island, New York. The album Land's End is the polished product of the married couple's road-tested music. It is both stalwartly traditional and thoroughly inventive, a paradox made possible by the special, rare alchemy they create on stage and in the studio. The two sound like no other pair because their collaboration, though deeply respectful of the past, bears no trace of slavish imitation. What the planxties of Michael Rooney share with the planxties of Turlough O'Carolan (1670-1738) is originality, a common bond that keeps them separate and distinct. From such traditionally familiar tunes as 'Paidin Ó Raifeartaigh' and 'The Old Maids of Galway' to such other compositions by Michael as 'Glor na nAingeal' and 'Mairead Gheal', the album's emphasis is on appealing melodies served by prodigious technique, not the other way around. Michael and June's playing alternates between drive and delicacy with equal ease and expertise, dispelling any straitjacket stereotype of what a harp and a flute can or should do in Irish traditional music. Their music is simultaneously turf-rooted and outward-looking. It is Montauk facing east and Sligo, where Michael and June are constructing a home together, facing west. Each represents a land's end, and each symbolizes how playing as impressive as theirs can close any distance. With deft support from Laura Maher on cello, Padraic O'Reilly on piano, Fergal Scahill on guitar, bodhran, and fiddle, and Michael's siblings Fionnuala and Aonghus on harps, this new album by Michael Rooney and June McCormack offers truly transporting music.